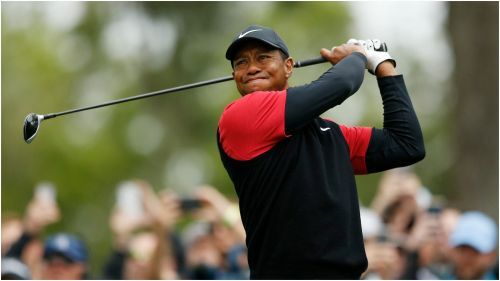 Tiger Woods says he is "right on track" to challenge at the Masters despite a disappointing result at The Players Championship, where Jim Furyk was capitalising on the leaders' difficulties. The 14-time major champion looked set for his lowest finish of the year as he completed his final round at TPC Sawgrass on Sunday, with a three-under 69 only good enough for him to finish on six under for the week. But Woods does not feel his game is far away from where it needs to be to challenge at the biggest events, claiming that he was only a few putts away from getting on a run. "[My game] is right on track," he said. "I feel like I'm able to shape the golf ball both ways, which I'm going to need there [at Augusta]. "I just need a few more putts [to] go in, but that's about it." Expanding on where his week fell down, Woods immediately pointed to his quadruple-bogey at the iconic par-three 17th which set him back in his second round. "I was close to getting over the hurdle and getting things rolling," he said. "And unfortunately I made a seven over at 17. "I missed a few putts that could have very easily got the momentum going and gotten me on a run. I was close." While Woods was well out of contention by the time he finished, there was an almighty tussle taking place at the top of the leaderboard. Last year's United States Ryder Cup captain Furyk moved into a tie for the lead with Jon Rahm and Tommy Fleetwood as he went three under through 10. Jon Rahm was 1 year old when Jim Furyk made his debut at @THEPLAYERSChamp in 1995. Furyk bogeyed the first but bounced back with an eagle at the second and steadily climbed the standings as those at the top faltered. Rahm, the 54-hole leader, was a miserable three over through four but recovered to two over by the seventh, while Fleetwood also bogeyed the first. Those two at least maintained a share of the lead, unlike Rory McIlroy who fell behind with a double bogey on the fourth and a further bogey at the seventh.